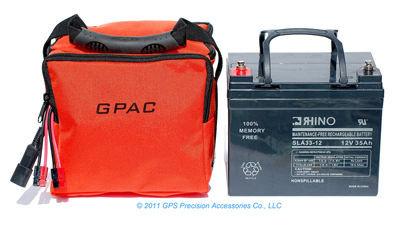 The GPAC Portable Power Solution is an organized system of batteries, cases, chargers, cables, and power accessories, to supply 12 volt power to various types of GPS and Survey Instruments. The Portable Power Solution is designed to delivery optimum power in a safe, easy to carry package. The system eliminates the caustic, fume producing lead acid batteries that are difficult to handle safely, can tip over and spill acid, and can produce corrosive fumes that are detrimental to your expensive GPS and Survey equipment. The Portable Power Solution batteries are totally enclosed to prevent accidental contact with the battery posts causing short circuits that can ruin the battery. The batteries are recharged through either of the outputs so you never need to access the battery directly. They are spill proof, can be operated upside down, and don't produce any corrosive fumes. 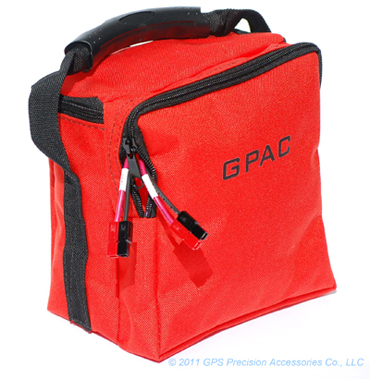 The system employs a heavy duty, 1000 denier, highly visible, safety orange, ballistic nylon carrying case. The cases are non-conductive, very strong, and have a built-in storage compartment for the battery cables, output connectors, and accessories. 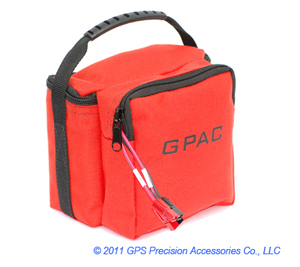 Carry straps have a soft molded handle that is comfortable and balances the weight evenly in your hand. All models have two power outputs terminated using Anderson Power Pole connectors. Anderson Power Pole connectors are genderless allowing them to mate with themselves. Cables and accessories exchange between the different models and multiple packs can be plugged together to increase the total capacity of any one pack. There are many different battery cables and accessories available to power virtually all models of Survey Equipment including Ashtech, Leica, Pacific Crest, Sokkia, Topcon and Trimble models. Custom cables are available on special order that combine data collection and power into a single cable. Useful for instruments that only have a single shared connector for both power and data. The Model 1209, 12 volt 9 amp hour pack features 2 - 15 amp fused outputs with Anderson Power Pole connectors. The 1209 weighs approximately 6 pounds. For illustration, according to Trimble's published specifications, a model R8 GNSS receiver's power consumption is 3.2 Watts. Therefore a fully charged 1209 pack will operate that R8 for approximately 33 hours. The math: 108 watt/hours divided by 3.2 watts equals 33.8 hours. One of the two outputs can be used for recharging the pack. The charger cable mates with either of the two outputs. This insures that the charger is correctly connected to the battery. The supplied charger (included in the complete package) will recharge the battery in 9 hours or less. The 1218 features 2 fused 30 amp outputs with Anderson Power Pole connectors and a 18 amp hour battery. Like the 1209 it shares all of the same features with the exception of battery capacity and size. The 1218 weighs approximately 12 pounds, yet is easily transported due to the soft grip handle. The 18 Amp Hour battery has plenty of reserve capacity and is the right choice for most Total Stations. For example, a Trimble 5600 will run 15 hours in Autolock mode or 10 hours in Robotic mode with a single charge. The supplied charger (included in the complete package) will recharge the battery in 9 hours or less. The Model 1235 features 2 - 12 volt 30 amp fused outputs with Anderson Power Poles and 1 SAE 2-pin covered connector fused at 30 amps. For example the pack can run a Pacific Crest HPB PDL or RFM96W 35 watt base radio and the GPS receiver for about 8 hours with the Hi/Low power switch set to the Hi Power position. (35 watt output). Multiple packs can be plugged together to increase the amp hour rating. The complete pack with power cable, battery and accessories weighs approximately 25 pounds.